Three autonomous underwater vehicles searched for wrecks last year at Marzamemi, off the Sicilian coast. No one knows what happened at Atlit-Yam. The ancient village appeared to be thriving until 7000BC. The locals kept cattle, caught fish and stored grain. They had wells for fresh water, stone houses with paved courtyards. Community life played out around an impressive monument: seven half-tonne stones that stood in a semicircular embrace around a spring where people came to drink. Then one day, life ended. Not far off the coast of the village of Atlit in the Mediterranean Sea, near Haifa, lies the submerged ruins of the ancient Neolithic site of Atlit Yam. The prehistoric settlement, which dates back to the 7th millennium BC, has been so well preserved by the sandy seabed that a mysterious stone circle still stands as it was first erected, and dozens of human skeletons lay undisturbed in their graves. Atlit Yam is one of the oldest and largest sunken settlements ever found and sheds new light on the daily lives of its ancient inhabitants. Today, Atlit Yam lies between 8 – 12 metres beneath sea level and covered an area of 40,000 square meters. The village that once sat on the Mediterranean coast now lies 10 metres beneath the waves off Israel’s shore. It was inundated when sea levels rose at the end of the last ice age. But Atlit-Yam was destroyed before then, and swiftly, perhaps by a tsunami. Buried under sand at the bottom of the sea, it now ranks as the largest and best preserved prehistoric settlement ever found on the seafloor. Human skeletons still lie there in graves, undisturbed. For marine archaeologists, Atlit-Yam is a trove from the Neolithic world. Research on the buildings, tools and the remains of past lives has revealed how the bustling village once worked. “It looks as though it was inhabited until the day it was submerged,” said Benedetto Allotta, head of industrial engineering at the University of Florence. But for all the secrets the site has shared, it is only one window into a lost world. For a fuller picture, researchers need more sunken settlements. The hard part is finding them. In January, work will start on a new project to transform the search for sunken cities, ancient shipwrecks and other subsea curiosities. Led by Italian researchers, Archeosub will build a new generation of robotic submarines, or autonomous underwater vehicles (AUVs), for marine archaeologists. “You can find plenty of human settlements not far from the coast,” Allotta said. Researchers from University of Porto preparing to ready to launch an AUV. The goal of Archeosub is to put sophisticated AUVs in the hands of cash-strapped researchers. That, in part, means turning the costly, heavy technology of the military and oil industries into far cheaper and lighter robots. They must be affordable for archaeological organisations and light enough to launch by hand from a small boat, or even the shore, rather than from a winch on a large research vessel. Slashing the cost and weight is only the start. The team behind Archeosub has begun to make the AUVs smarter too. When thrown overboard, the submarines can become part of an “internet of underwater things” which brings the power of wifi to the deep. Once hooked up, the AUVs can talk to each other and, for example, work out the most efficient way to survey a site, or find particular objects on the seabed. Field tests show the approach can work. When cargo ships near Porto in northern Portugal lose containers overboard, AUVs can be deployed to find the missing goods. And in a trial last year, Allotta’s group sent three AUVs to search for wrecks at Marzamemi, off the Sicilian coast. The site is the final resting place of a Roman ship, known as the “church wreck”, which sank while ferrying pre-formed parts of marble and breccia for an early Christian church in the 6th century AD. “We used the AUVs to pass through and look for new ruins,” Allotta said. 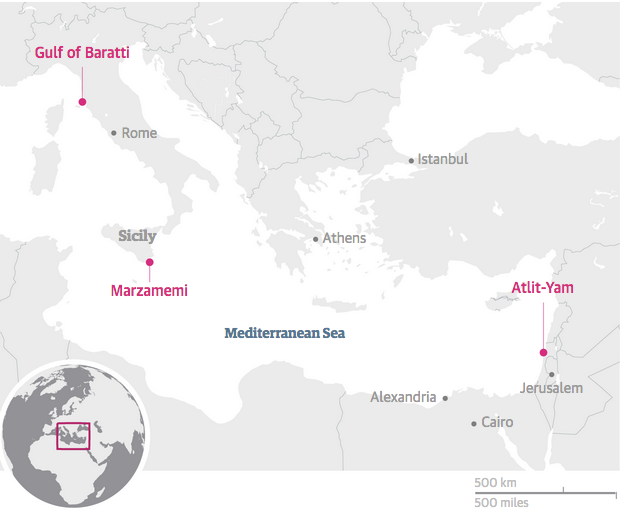 “We could do a reconstruction of the area, where old Roman ships sank while bringing marble columns to Italy,” he said. The underwater archaeological site of Marzamemi, Sicily. The site is the final resting place of a Roman ship which sank while ferrying marble and breccia for an early Christian church in the 6th century AD. Creating an internet beneath the waves is no breeze. Slip under the surface and the electromagnetic waves used in wifi networks travel only centimetres. Instead, a more complex mix of technologies is called for. Acoustic waves, which are affected by depth, temperature, salinity and surface wind, are used to communicate over long distances underwater. At close range, AUVs can share data over light beams. But more creative solutions are also envisaged, where an AUV working on the seabed offloads data to a second which then surfaces and beams it home by satellite link. Work is underway on AUVs that can beam pictures from the seabed over acoustic waves, and dock with others that charge them up. Surface buoys that receive GPS signals tell the AUVs where they are. “If you want to build an internet of underwater things, you cannot use the technology we have developed for the terrestrial world,” said Chiara Petrioli, a computer engineer who leads the work under the Sunrise project at Rome University. David Lane, a professor of autonomous engineering at Heriot-Watt University in Edinburgh, has created a marine version of Dropbox for the underwater internet of things. It allows AUVs to share information from seafloor scans and other data. So if an AUV on a first pass survey spies an intriguing object on the seabed, it can share the coordinates with a nearby AUV that carries better cameras and sonar, and arrange for a closer inspection once it has left the area. “The use of these vehicles has huge potential for marine archaeology,” Lane said. One site where Allotta plans to deploy the new AUVs is the Gulf of Baratti off the coast of Tuscany. In 1974, a remarkable shipwreck was discovered there in 18 metres of water. More than a merchant ship, the 2000-year-old vessel was a travelling medical emporium. More than 100 wooden vials were found on board, along with other ancient medical supplies, including tin containers of tablets that may have been dissolved and used as eyewash. Other Roman ships went down in the waters, shedding cargoes of olive oil and wine held in huge terracotta pots called dolia. Often it is only the dolia that remain, the wooden ships lost, or at least buried, under silt. Allotta hopes to have the first test results from the Archeosub project in the summer. “Right now, we don’t have the right technology to give to archaeologists,” he said.